Fu 1015, the most extravagant and priciest restaurant among the Fu restaurant series (include Fu 1039, Fu 1088 and Fu He Hui), serves refined Shanghainese cuisine in nostalgic old villas. The restaurant located on Yuyuan Road in the city center, next to its sibling restaurants. There’s no obvious signboard, you will never thought of there is a restaurant in such an old building. Fu 1015 is positioned at No.16 of Asia’s 50 Best Restaurants 2015. Different from most of the Chinese restaurant in China, which have noticeable signboard to create the manner, the main concept of Fu 1015 is to create a feeling of family fine dining as the rich family did in 1930s, which is more home and has more privacy. Thus the restaurants features only private rooms even for party of two. Some people may judge about Shanghainese food, because classical Shanghainese dishes widely uses sugar and soy sauce, heavy in oil and thus stronger in flavor and color. In order to make the food more ‘fine’, Chef Lu refined the dishes with a Huaiyang (淮扬) and Hangzhounese(杭帮) twist. Fu 1015 serves set menu for small party size, priced at CNY 1616 for 2 pax. The menu includes appetizers, 1 soup, 4 mains, 1 dim sum and 1 dessert. As requested for trying more variety of dishes, the chef prepared a special menu for us which includes features different dishes under each section. We started with four assorted cold dishes, start with the lighter to the heavier one. Tofu sheet rolled with Kalimeris (香干马兰头) was a bit bland and dry, although quite small in size, it was quite filling. Lotus root stuffed with sticky rice (糖藕) was well-cooked and flavored even the stuffed rice part, really enjoyed these two sweet and warm bites. For the foie gras with organce jelly (金桔鸭肝酱) ,foie gras was smooth but too liquify for my liking, the organe jelly nicely brought a refreshing hint. I enjoyed the Shanghainese bloated fish (老上海熏鱼) the most among all four appetizers, served warm with a crispy, brown caramelized outer-layer and moist center. The entire piece was nicely flavored with soy and sugar, one of the best blated fish dishes so far. We tried two soups, start with the lighter Double Boiled Matsutake Soup with Wild Bamboo Pith (松茸炖野生竹笙) , the clear soup boiled only with mushroom was incredibly umami. While the signature Braised Japanese Sea Cucumber with Wild Rice in Golden Broth 金汤野米焖辽参 was more memorable. The sea cucumber was tender and slippery, the golden broth was the key factor to make the dish imprssive, rich and full of umami flavors. Followed by the main courses. Braised Prawn served with Fried Bun (辣椒烧明虾伴雪茄馒头) is another classical dish at Fu 1015. The prawn was large in size and very tender, the sweet-and-spciy sauce reminds me of Chili Crab from Singapore. The fried prawn balanced well with the spiceness. Braised pork (红烧肉) is not doubt a signautre dish of Shanghainese cuisine. The indulgent cube was perfectly braised - the meat was succulent, the fat part was not greasy at all, the entire piece was very flavorful. The braised bamboo shoots was too delicious. Served together with Deep-Fried Prawns with Wasabi Mayonnaise Dressing and Crispy Prawn Flakes (香溢红烧肉拼珊汁芝麻虾), which has a crispy outer-layer, while the prawn meat was a bit dry for my liking. I had similar one at my favorite Chinese/Hangzhounese restaurant in Hangzhou, Jin Sha (金沙厅). 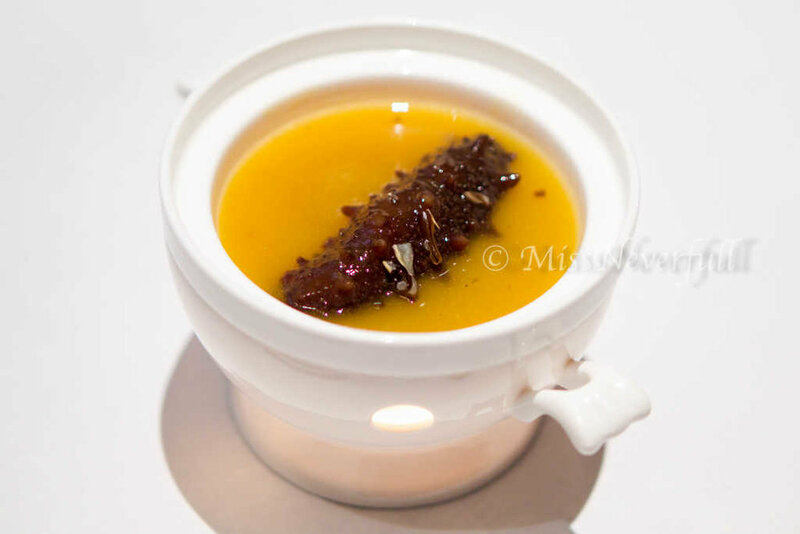 Besides the previous sea cucumber soup, we also had the Braised Japanese Sea Cucumber with Scallion Oil (葱烧关东辽参). The sea cucumber was also tender and slippery but quite fair on the flavor side. In compairison, we more enjoyed Steamed Rice with Soy Pork Belly and Abalone in Black Truffle Sauce (黑松露鲍鱼红烧肉焖饭). The rice was cooked in the clayport, its fragrance with a black truffle blend was very enjoyable. The abalone and pork was very tender and flavorful. The set menu also includes a green dish (we tried two though). The sauteed pea sprout (炒豆苗) was topped with assorted mushroom to enhance the flavor. The Shredded Bean Curd in Yangzhounese Style (扬州干丝) with prawn and bok choy was one of the best i had so far, the umami flavor of the chicken broth base went through the bean crud very well. Dim sum comes after the main dishes. 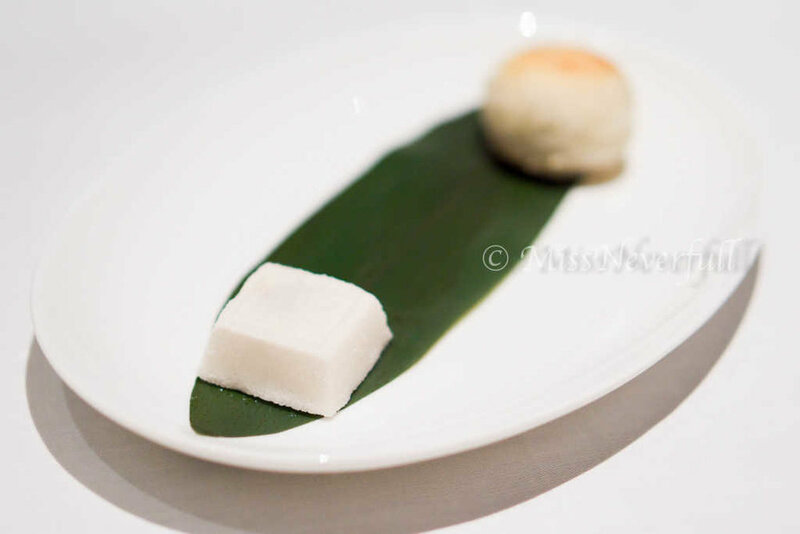 The first we had was two warm-served traditional Chinese dim sum, the steamed sweet date sticky rice cake (枣泥方糕) was made of hand-hulled rice flour, the date filling brought a lovely aroma and flavor to the entire piece. I much preferred the side savory pastry, seaweed pastry with cashew and walnut (腰果核桃苔条酥), the pastry skin was flaky, the umaminess of seaweed filling balanced well with the crunchy nuts. While the second dim sum - Wonton with Salted Vegetable and Diced Yellow Fish (雪菜黄鱼馄饨) was stuffed with fresh yellow fish, very moist and umami. The best part supposed to be the soup base but it was too salty and quite fishy. Soy Milk Ice-Cream with Shanghaineses Fried Twisted Dough Sticks (豆浆油条) is a classical dessert at Fu 1015. 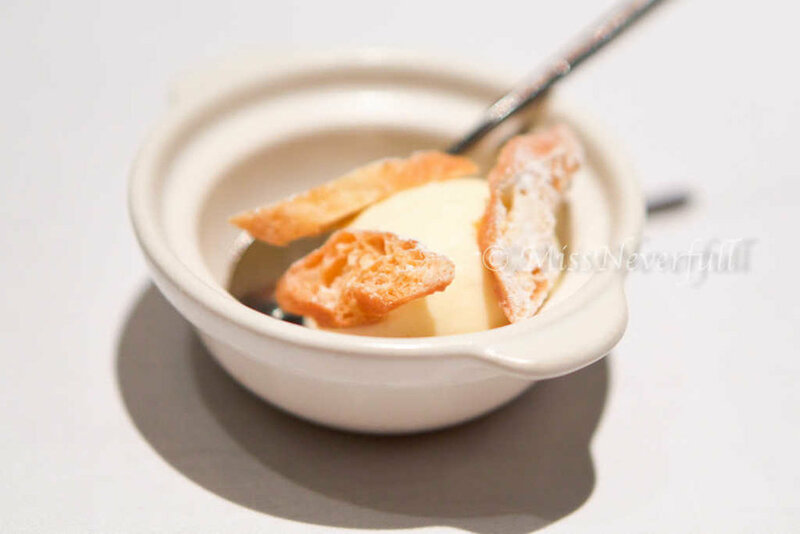 It was inspired by the Shanghainese breakfast, soy milk and fried bread dough. I had this at some other Chinese restaurants in Shanghai, i loved its creative concept but the flavor was not really impressive. Homemade Raisin Ice-Cream with Rum (朗姆酒葡萄干冰糕) was less memeroable compare to the previous dessert. It tastes like normal milk ice cream and the rum flavor was quite weak. It was a pleasant Shanghainese dinner, the ingredients were fine and cooked very well. Some of the dishes were quite fair but there were also some highlights such as bloated fish, braised pork, steamed rice, and the dim sum. The ambiance is very different from the normal Chinese restaurant as we feel more privacy, the service was a bit above average. I would like to recommend Fu 1015 but i dont think it is that good to be qualified for No.16 of Asia's 50 Best.